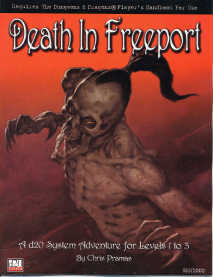 Blurb : Welcome to Freeport, a city of secrets and deceit. Founded by pirates, this great trading city is no stranger to dirty dealings and bloody payback. Now under the rule of the Sea Lord Drac, Freeport is on the threshold of a great change. Only the gods know if this transformation will be for good or evil. The Module : Aesthetically a module that is well laid out with good maps and reasonable to excellent artwork. The four page introduction section gives us a history of the city where we learn that Green Ronin plan to base a series of adventures, this being the first. The city is basically a fairly liberal port and I think could fairly easily be substituted for an alternative location in any DM's campaign world. The core aim in the adventure is to locate a missing librarian from the temple to The God of Knowledge. The adventure is well paced for 1st level characters but is not a simple dungeon-bash, and the players will have to do some thinking as they follow leads and interact with potentially dangerous adversaries. A new monster type is introduced, (the serpent people), who are in my humble opinion too weak. I also felt that the main dungeon was a little small however for 1st level characters anything longer may prove more dangerous. It was nice to see handouts in the module and an appendix with all the main characters and monsters. My only pet peeve here is the inclusion of pre-rolled characters which is a waste of two perfectly good pages. If you are new to the game then I'm sure the DM will have you rolling up a character straight from the new books, and if you've been around a while then you will probably prefer to create your own perfectly tailored character. Bad Points : Main dungeon a little small.